A thorough knowledge of root canal anatomy along with the anatomical variations that may be present is essential for success of endodontic therapy. 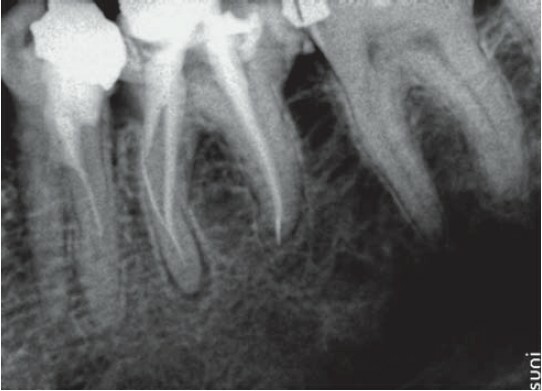 Unusual presentations in the number of the roots or the canals should be expected in every tooth. Mandibular second premolars are thought of as having a single root and canal. Studies have stated that the prevalence of three canals with three orifices in this tooth is 0.4%. The mandibular second premolar is particularly difficult to treat owing to the fact that a wide variation in the number, location and curvature of the roots and canals exist. Added to this is the fact that the access opening is restricted and location of the lingually placed orifices is difficult. This case report details the re-treatment of a mandibular second premolar with three canals and three separate orifices using the surgical microscope. Hoen and Pink found a 42% incidence of missed roots/canals in the teeth that needed re treatment. The use of magnification and fiber optic illumination offers a tremendous advantage in locating and treating extra canals. This case report details an endodontic re-treatment in a mandibular second premolar where 3 canals with 3 different orifices were found and treated under the surgical microscope. A 28-year-old male patient reported with fractured restoration in the lower left back tooth. The tooth was asymptomatic and patient gave a history of root canal treatment of mandibular left first molar (36- Federation Dentaire Internationale [FDI] nomenclature) and mandibular left second premolar (35-FDI nomenclature) 2 years back. 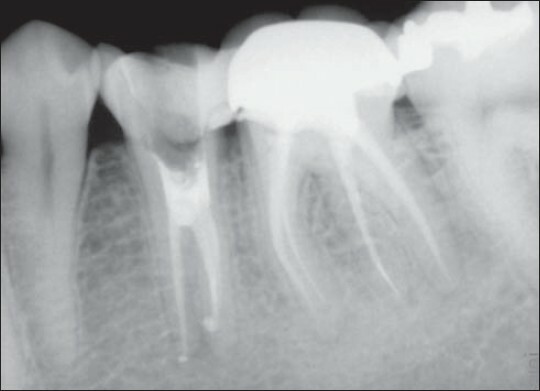 Radiograph of the complaint area revealed inadequately obturated root canals of 35 [Figure 1] and it also exhibited atypical root canal anatomy. Patient was informed regarding the same and the tooth was posted for retreatment. After removal of coronal restoration, the access preparation was modified to access mesial and distal canals as evident in the pre-operative radiograph [Figure 2]. Gutta percha was removed using RC solve (Prime Dental Products, Mumbai, India) and re-treatment files (Dentsply, USA). The extra canals were located using the surgical operating microscope (Moller Wedel, Germany) and canals were carefully negotiated to full length using size 10 K file (Mani, Japan). Preflaring was carried out with Gates Glidden drills (Mani, Japan). The root canal anatomy of 35 closely resembled that of 36 having separate mesio-buccal, mesio-lingual, and distal canals. Working length was estimated using electronic apex locator (Raypex 5, VDW Endodontic Synergy, Germany) and the same was confirmed with a radiograph that also showed 3 distinct canals extending up to apex [Figure 3]. Chemo-mechanical preparation was done using rotary Protaper files (Maillefer Dentsply, USA) with adequate irrigation using 5% NaOCl (Vishal Dental Products, Mumbai, India) till size F2. After the chemo-mechanical preparation, canals were flushed with 17% Ethylene Diamine Tetra Acetic acid (EDTA) (Dent Wash, Prime Dental Products, Mumbai, India) to remove the smear layer. The canals were obturated using gutta percha points (Dentsply, USA) and AH-Plus sealer (Dentsply, USA) with the lateral condensation method. 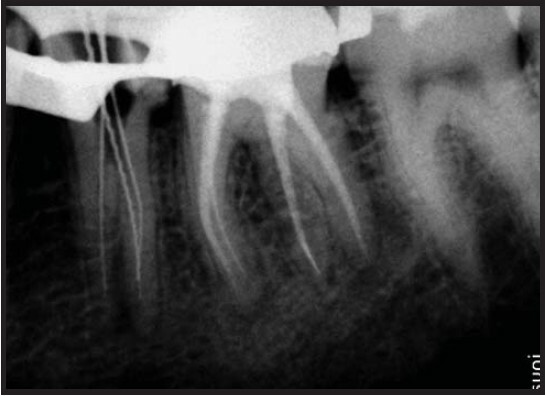 Post-obturation radiograph confirmed the adequate obturation of root canals [Figure 4]. Good quality radiographs taken at various horizontal angulations, use of the DG-16 explorer (Hu Friedy, USA), use of champagne bubble test, operating microscope, increased magnification with loupes etc. are various ways of locating the canal orifices. In the pre-operative radiograph, sudden narrowing of the canal space or disappearance of the canal may be visible. Aberrant root anatomy may also be seen in the pre-operative radiograph. It has been shown from in vitro studies that a wide morphological variation exists as regards to mandibular premolars. It is essential for the operator to form a mental picture of the pulp in cross-section and from coronal aspect to the apical foramen. Each canal contains irregular and hidden regions that should be taken into account during endodontic treatment. As a group, mandibular premolars are very difficult to treat; they have a high flare up and failure rate. The root canal system is wider buccolingually than mesio distally. Direct access to the buccal canal is possible, whereas the lingual canal is more difficult to find. The lingual canal tends to diverge from the main canal at a sharp angle. In addition, the lingual inclination of the crown tends to direct files buccally, making location of a lingual canal more difficult. To counter this situation, the clinician may need to extend the lingual wall of the access cavity further lingually. It is important to use tactile sensitivity and also observe the direction of the instrument during its insertion into the root canal. 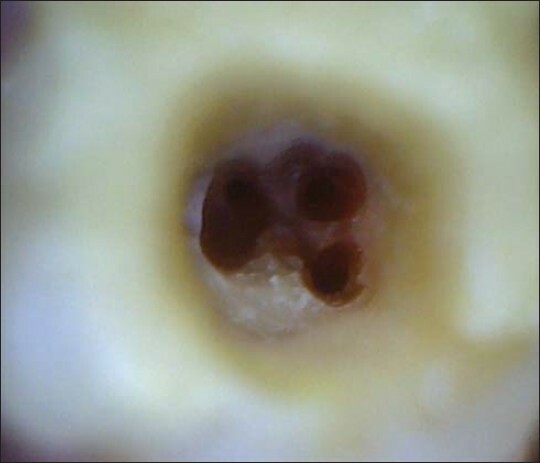 Preflaring of the root cervical portion allows a correct determination of the initial instrument and consequently a better cleaning of the apical third. The surgical operating microscope offers excellent visibility and increased illumination from the fiber optic light source. Studies have proved its efficacy in locating additional canal orifices. In this case, the tooth had come for re-treatment. From the pre-operative radiograph, it was evident that the root had an aberrant anatomy. Accordingly, the pulp chamber was examined under the operating microscope and the extra canals located. Endodontic re-treatment is a necessity when the earlier treatment has not been performed to the satisfactory level. In this case, even though, the tooth was asymptomatic, the decision to re-treat was taken because of the inadequate obturation seen. This is a potential reason for endodontic failure. The common solvents used for removal of gutta percha include eucalyptol and xylol. The softened gutta percha can be easily removed with the help of rotary re-treatment files. After locating the additional canals, the cleaning and shaping can be carried out with the rotary endodontic files. Studies have reported the incidence of multiple canals from 0% to 95% for certain roots. The clinician must have a thorough knowledge of the number, incidence, location and the variability of the canal systems to increase the chances of finding these additional canals. It is imperative for the clinician to be aware of these additional canals as overlooking them will result in failure. 2. Slowey RR. Root canal anatomy. Road map to successful endodontics. Dent Clin North Am 1979;23:555-73. 3. ElDeeb ME. Three root canals in mandibular second premolars: Literature review and a case report. J Endod 1982;8:376-7. 4. Vertucci FJ. Root canal anatomy of the human permanent teeth. Oral Surg Oral Med Oral Pathol 1984;58:589-99. 5. Zillich R, Dowson J. Root canal morphology of mandibular first and second premolars. Oral Surg Oral Med Oral Pathol 1973;36:738-44. 6. Champa C, Karale R, Hegde J. Aberration in root canal morphology of mandibular premolars. e-J Dent 2011;1:36-9. 7. Hoen MM, Pink FE. Contemporary endodontic retreatments: An analysis based on clinical treatment findings. J Endod 2002;28:834-6. 8. Carr GB. Microscopes in endodontics. J Calif Dent Assoc 1992;20:55-61. 9. Yoshioka T, Villegas JC, Kobayashi C, Suda H. Radiographic evaluation of root canal multiplicity in mandibular first premolars. J Endod 2004;30:73-4. 10. Hussain AA, Al-Nazhan S. Mandibular second premolar with three canals. Report of a case. Saudi Dent J 2003;15:145-7. 11. Vanni JR, Santos R, Limongi O, Guerisoli DM, Capelli A, Pécora JD. Influence of cervical preflaring on determination of apical file size in maxillary molars: SEM analysis. Braz Dent J 2005;16:181-6.